A member of the 501st Imperial Legion is raising money for the Starlight Children's Foundation by walking 5000 kilometers from Perth to Sydney, Australia, in full stormtrooper armor. The 501st Legion is sort of the public outreach arm of the Imperial forces. While everybody else is out enslaving thousands of worlds across the galaxy or getting their asses kicked by teddy bears with sticks, the guys in "Vader's Fist" work closer to home, mixing Star Wars fandom with fundraising, volunteer work, appearances at charity events and, every now and then, initiatives like Troopertrek 2011. The aim of Troopertrek is simple: raise awareness and money for the Starlight Foundation, an international organization dedicated to helping children and their families cope with chronic and life-threatening illnesses and diseases. But walking from Perth to Sydney is no small feat. It means, quite literally, walking from one side of Australia to the other. And make no mistake, Australia is a pretty big place. Jacob French, aka TK-6283, said his trek will cover roughly 5000 kilometers - 3106 miles - and take him across four states. He plans to walk 35-40 kilometers a day, carrying his supplies in a push buggy, all while decked out in a modified suit of full stormtrooper armor. It sounds a little crazy, yes, but French is the same guy who completed the Run Melbourne 21 kilometer half-marathon in two hours and 21 minutes, also in full armor. In other words, he knows a thing or two about crazy, but that experience also gave him a few ideas on how to improve the design of his suit for future events. "The suit was restrictive and got quite hot while I was running, but the seed was planted for the Troopertrek idea," he wrote on Facebook. "Since the marathon I have started to train regularly for this event and have acquired a much lighter and flexible set of armor that will be trimmed for better movement. I am hoping that by choosing to wear stormtrooper armor I will be able to gather more attention for the cause I am running for and have a bit of a laugh along the way." He's also offering to attend events on his route that think they might benefit from the presence of a stormtrooper. His goal is to raise $AU50,000 ($52,438); at the moment he's at 300 bucks, although to be fair he just got started a week ago. 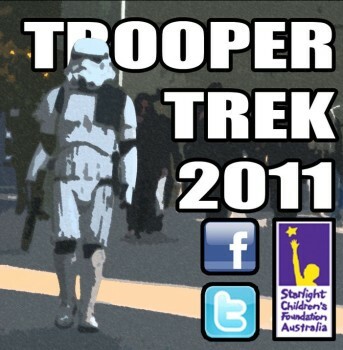 Troopertrek 2011 begins in July and, if he's able to keep up his planned pace, will take about six months to complete. To learn more about the quest, hit up the Troopertrek page on EverydayHero.com - and don't be afraid to kick in a few bucks for a good cause while you're there.